The Ambassador Full Sized Custom Journal Book! A best seller because of its quality and customization options. 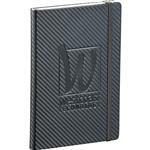 An elegant executive gift or conference notepad with a budget price! Built-in elastic closure. Ribbon page marker. Expandable accordion pocket. Includes 80 sheets of lined paper. One of our best sellers. Strongly suggest a blind deboss or laser engraving. FREE RUSH AVAILABLE! Typical Imprint Area(s): Deboss: Spine Bottom Centered on the front pocket L 8" x H 4"
Screen: Spine Left Centered on the front pocket L 5" x H 8". Available Imprint Options: Screen, deboss or full color epoxy dome. Additional running charges apply for multiple locations or colors. Please inquire. Full color imprint also available. 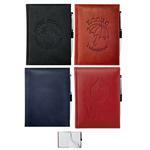 UltraHyde Journal Book, 11.75" H x 8.5" W x 0.42" L, 80 sheets.